Hundreds of US white nationalists have rallied at the University of Virginia, protesting against plans to remove a statue of a confederate general. 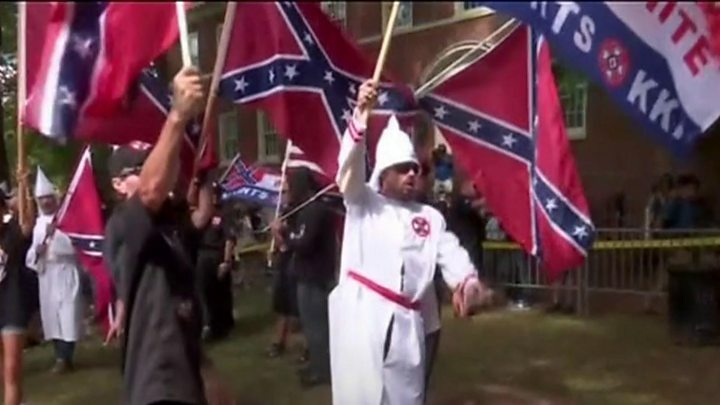 The group waved torches and chanted “Jews will not replace us” and “white lives matter” as they marched through the Charlottesville university. There were clashes with counter-protesters, while the local mayor condemned the march as racist. A larger “Unite the Right” rally is planned in the city on Saturday. The protesters are angered at the planned removal of a statue of General Robert E Lee from Charlottesville. Lee commanded forces of the pro-slavery Confederacy in the US Civil War. Protest organiser Jason Kessler, who has previously accused the town of “anti-white hatred”, described the event as an “incredible moment for white people who’ve had it up to here and aren’t going to take it anymore”. Demonstrators held lit torches – which some observers described as a reference to the Ku Klux Klan – and chanted “blood and soil” and “one people, one nation, end immigration”. The rally was met by a smaller group of counter protesters who had surrounded the university’s status of Thomas Jefferson, holding a banner that read “VA Students Act Against White Supremacy”. The marchers were tightly organised. 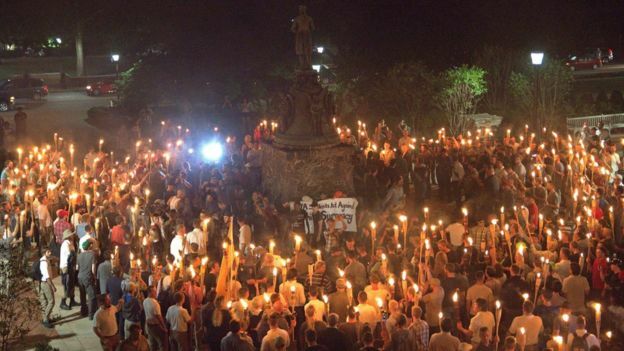 They gathered after dark at Nameless Park, where they lit their torches and formed into a line, which snaked out of the park and into the University of Virginia campus. Almost entirely white and male, and in their twenties and thirties, they chanted “You will not replace us”, “Blood and soil”, and “Our streets”. At the university’s statue of Thomas Jefferson they were met by a small group of counter-protesters, students of the university. One apparently sprayed pepper spray at the marchers and the two groups clashed. Police moved in and the marchers extinguished their torches, filling the hot air with acrid smoke. “The heat here is nothing compared to what you’re going to get in the ovens,” shouted Robert Ray, a writer for white supremacist site Daily Stormer. “I never thought I’d have to see this in America in my lifetime,” said one of the counter-protesters, a student who did not want to be named. The marchers slowly dissipated. Across the street, more than 500 people were packed into St Paul’s Memorial Church, where they had heard readings from the Bible and the Quran and prayers for peace and unity in Charlottesville. At the end, the congregation filed slowly out of a side door to avoid the violence. The protest was criticised by many local residents and politicians. Charlottesville mayor Mike Signer called the march “a cowardly parade of hatred, bigotry, racism and intolerance”. Charlottesville is considered a liberal college town – and 86% of the county voted for Hillary Clinton in last year’s presidential elections. However, the town has become a focal point for white nationalists after the city council voted to remove a statue of General Lee. Some observers also argue that US President Donald Trump’s election to the White House re-energised the far right across the US. Last month, Ku Klux Klan supporters staged a march in Virginia – but were outnumbered by counter-protesters. Are stem cells the key to anti-aging treatments?